Roanoke is the retail center of southwest Virginia, highlighted by shopping malls, specialty boutiques, art galleries, furniture warehouses, antique shops and much more. 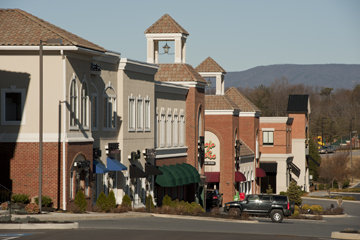 Visitors and residents alike have the opportunity to enjoy both familiar national chain stores and original stores unique to the Roanoke Valley. Over 190 shops operate in downtown Roanoke, which centers on the Farmer's Market, the oldest and continuously running in the state. The Market has been recognized nationally as a "Great American Public Place" by the Lyndhurst Foundation alongside other winners such as the Vietnam Veterans Memorial in Washington and Central Park in New York City. Many festivals and events take place in downtown Roanoke throughout the year including Dickens of a Christmas, Festival in the Park and First Fridays. For more information, visit Downtown Roanoke, Inc. at www.downtownroanoke.org. Valley View Mall - The largest shopping mall in southwest Virginia at 1.1 million square feet, featuring four department stores, over 125 specialty stores, a food court, and a nearby 16-screen cinema. The area surrounding Valley View Mall has grown exponentially in recent years, including additions of restaurants, specialty stores, and department stores including Target, Best Buy and Wal-Mart. Tanglewood Mall - Roanoke's first regional mall, featuring five department stores, over 75 specialty stores, and a food court. Theme-styled exhibits are often hosted and there is a nearby 10-screen cinema.